Unless you are considerably better read on transgender affairs than I am, you probably don't recognize the name. I didn't until she burst into my conscience this morning on the CBS Sunday Morning Show. As I was getting ready to undertake my Sunday morning chores (including a blog post...a fun chore) I paused to watch the "Opinion" segment of the show. All of a sudden, host Jane Pauley was talking about resident rumps' position on blocking transgender troops from serving. 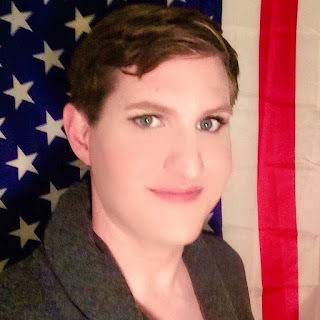 Then, she introduced Charlotte Clymer, a real transgender veteran. I probably don't have to tell you what happened next. Charlotte proceeded to lay out her military experience explaining how when she folded a flag as an honor for a troop who paid the ultimate sacrifice, it didn't matter if the person was white, black, gay or straight and finally transgender or not. Of course she went on to point out "commander bone spurs" (rump) didn't serve at all. Plus, rump was going against some of his top military generals who favored trans service. Obviously, positive/strong opinions like Charlotte's are hard to come by and so needed!